The event will have 200+ booths brimming with antiques, vintage, and vintage-inspired items brought by exhibitors from many states. If you’re looking for more information about visiting the Bella Rustina Modern Vintage Market, click on the Show Info tab above. 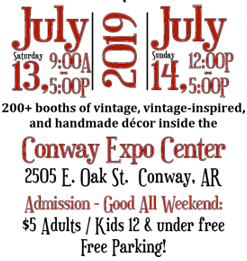 If you’re interested in becoming an exhibitor, please check out our Booth Registration page (Please choose the Little Rock Registration or Conway Registration tab at the top of the page) where you can see our booth layout, fill out an Exhibitor Registration Form, and reserve your booth(s). For your convenience, you can even pay your booth deposit online.